Every year, the Williams Fund recognizes faculty members from across campus for their insightful approaches to undergraduate teaching. An upcoming showcase will feature a panel of Williams Fund fellows and instructional grant recipients who will share insights and takeaways from their experience enhancing undergraduate education at the UO. The panel will include Michelle McKinley, the Bernard B. Kliks professor of law; Kate Harmon, an instructor in the Lundquist College of Business; and Julie Haack, a senior instructor of chemistry in the College of Arts and Sciences, as well as a few other past fellows and grant recipients. Harmon and Haack are the faculty members behind the UO Sustainable Invention Immersion Week, which was one of seven instructional proposals chosen by the Williams Council for 2017-18. 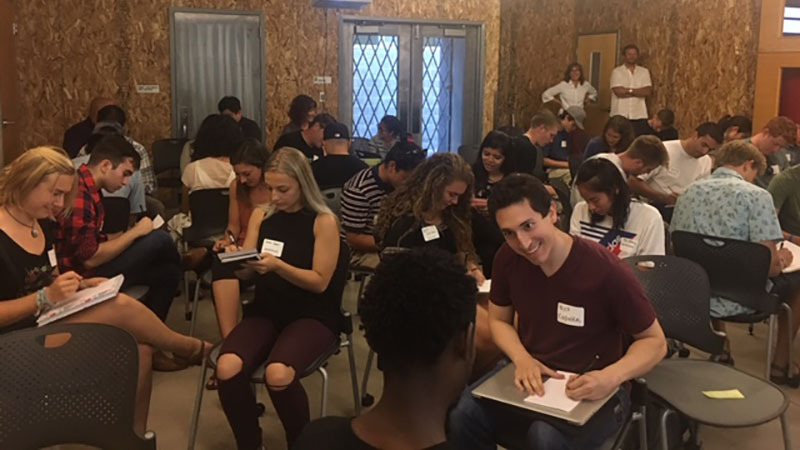 The program was a one-week, entrepreneurial boot camp that brought students from across disciplines together to develop ideas to solve an environmental problem. The program was a first step toward building a wider campus “community of practice” around sustainable invention, while also giving students the opportunity to assess their ideas from a product and business standpoint. “The two student teams who continued working on their ventures beyond the week participated in national business competitions, secured additional funding and legally organized their businesses working with the sustainable invention faculty team during the year to refine their products and business models,” Harmon said. Along with instructional proposals, the council selects a small number of Williams fellows based on nominations. McKinley, a 2018-19 Williams fellow, is known for her exceptional mix of knowledge, passion, commitment and the care she brings to the classroom. McKinley’s undergraduate courses focus on questions of citizenship, immigration and human rights. She regularly brings simulation exercises into the classroom and appoints students to lead discussions to promote thoughtful exchanges. Lee Rumbarger, assistant vice provost for teaching engagement and one of the showcase organizers, regularly works with faculty members across campus to create inclusive, engaged and research-led teaching environments. The Williams Fund Showcase will be Wednesday, Nov. 7, from 11 a.m. to 1 p.m. in the Erb Memorial Union’s Crater Lake North room. Faculty members interested in learning more about the Williams Fund and the work of past recipients are encouraged to attend. To RSVP or find more information about the showcase, visit the Teaching Engagement Program’s website. Nominations for Williams fellows and instructional proposals applications for 2019-20 will open in winter term. For more information about the Williams Fund, the Williams Council and past proposals and awards, visit the Office of the Provost’s website.